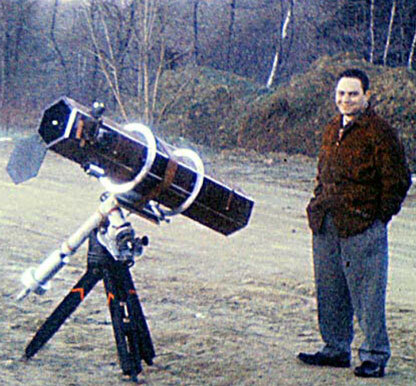 The young Al Nagler with the 8-inch Newtonian reflector he built at the Bronx High School of Science. Credit: Al Nagler. In 1977, Al co-founded Tele Vue Optics. The first products he designed and manufactured were projection lenses for big-screen TVs. However, he never forgot his love of astronomy. By 1979 he had the original 13mm Nagler designed, but felt he couldn’t bring such a product to market without the company already having its reputation established in the field. Nagler designed and patented a new Plossl series of eyepieces that were– and remain–renowned for their sharp images to the edge of the field. 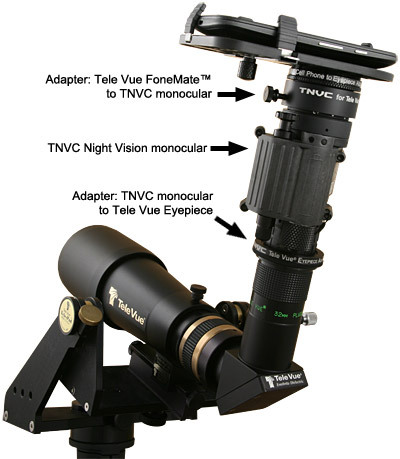 In 1980, Tele Vue launched the first “Nagler” eyepiece that revolutionized amateur astronomy. With an 82-degree apparent field of view, the Nagler was the first to give well-corrected wide “spacewalk” views of the night sky that are now so prized by serious stargazers all over the world. The company has since developed many lines of innovative and premium-quality eyepieces including today’s Panoptic, Nagler Zoom, Ethos, Delos, and DeLite offerings. Al designed Tele Vue’s first refractor, the Multi-Purpose Telescope (MPT), out of necessity. Since the hallmark of the company has been 100% quality control, there was no single instrument available at the time that would allow him to efficiently inspect his eyepieces for optical performance as well as internal cleanliness. He also needed it to be compact because at that time he was testing off of his kitchen table. Al’s solution became the MPT: a flat-field, 5″, f/4 refractor with an iris diaphragm aperture stop that allowed slowing the scope down to f/16. The adaptation and advancement of the “Petzval” concept to a telescope began with the MPT and continues on in today’s “NP” (Nagler-Petzval) scopes. Recently, Al took some time out of his busy schedule to answer a few questions we posed to him by email. In writing out his thoughtful answers to our questions, Al included his own insights as well as many more from his son, David Nagler, the president of Tele Vue Optics. Al reminded us that David has worked at the company full-time since 1988, about ten years before Al himself joined the company full-time! Q: What’s your favorite eyepiece-telescope combination these days? For lunar/planetary observation? For deep-sky observing? A: For lunar/planetary, the NP127is refractor (660mm focal length) with either an Ethos or Delos eyepiece is my favorite combo. The 3.7mm Ethos at 178x is near the atmospheric planetary magnification limit in my area, and with a 0.6 degree field of view it shows the entire moon beautifully. Which brings to mind what was probably my most memorable lunar view: it was using a pair of 8mm Ethos eyepieces in our BinoVue in the 600mm focal-length TV-85 refractor. Just imagine the entire moon in “3-D” at 150x! For wide-angle deep-sky viewing, the NP127is with a 31mm Nagler or 21mm Ethos is my favorite combination for viewing large structures like the entire Veil and North America Nebulae, virtually all of the Andromeda galaxy, and large star clusters such as the Beehive and Double Cluster. The most remarkable object of all for me is the M24 star cloud in Sagittarius. Of course, higher power Ethos, Nagler, or Delos eyepieces are wonderful for many globular clusters such as M13 and M22, the Ring Nebula, Dumbbell Nebula and lovely nebula/cluster combinations like the Swan Nebula. (Sorry, I don’t know how to stop!) However, the “Majesty Factor” of the Ethos eyepieces, especially for Milky Way and star field viewing, is really “it” for me. (The “Majesty Factor” is the combination of image scale, exit pupil (contrast), and true field of view as they relate to apparent field of view. You can learn more about it in my essay at http://televue.com/engine/TV3b_page.asp?return=Advice&id=114). Most recently, since installing a PVS-14 night vision monocular on my eyepieces (more on this later), I’ve discovered an alternate type of deep-sky viewing where our relatively modest aperture scopes can punch well beyond their weight class. Objects barely visible in our light polluted skies, such as the North America and Crescent nebulae are enhanced dramatically and star clusters just come alive. I do freely admit that many smaller and fainter deep-sky objects are astonishing in large aperture reflectors, but that type of scope no longer fits my personal lifestyle. So, I’m content going to dark-sky star parties and using other peoples’ larger Dobs. Q: What is it, in your opinion, about the view through the eyepiece of a telescope that can never be reproduced by a camera? I followed Neil deGrasse Tyson’s advice for the 2017 solar eclipse. Forgive my paraphrasing, but he said something to this effect: put down the cameras and see it as best you can visually! To create the most memorable experience I could for my friends, family, and guests at our Columbia, SC location, I used our NP101 Apo refractor with a 17mm Ethos eyepiece during totality to see stunning coronal detail along with gorgeous pink prominences, with the added gift of seeing the twinkling star Regulus in the outer field! Neil was right. I’ve seen many wondrous images of the 2017 eclipse and as astonishing as some are, they don’t compare to the excitement of having visually seen it with my own eyes. Q: Despite the pleasures of looking through an eyepiece, when you survey the field at most star parties these days you see a lot of screens and cameras and blinking red lights. Astro-imaging and its more user-friendly cousin, electronically-assisted astronomy (EAA), seem to be more popular than ever. Do you think there’s much of a future for purely visual observational astronomy? A: I hope so! Similar to the answer above, an EAA system or CCD imaging can’t give you a 110-degree field with full eyesight resolution and contrast. Yes, digital image-capturing devices can give more color to deep sky images but you are limited to the screen resolution, viewing angle, and magnification range. An important enjoyment in my pursuit of amateur astronomy is seeing the absolute beauty of the naked-eye view of the night sky. Using any electronic device ruins my dark adaptation which diminishes that experience and makes it hard to read star charts or choose eyepieces until my dark adaptation returns. I believe that is an underappreciated concern in using these devices. However, please don’t mistake the above as a rejection of the benefits of these devices. I simply consider, and think others should as well, that these devices are additional tools in my observational kit. Attaching a Night Vision monocular, such as a PVS-14, to our eyepieces and small aperture scopes allows going much deeper, with a greater magnification range, and enhances the versatility under all sky conditions. How could you not like that? Q: Tele Vue’s record of design and innovation is quite astounding, and you’ve been releasing new eyepiece designs continuously for more than 30-years. Of course, many people are wondering what’s next. With the push to offer ever-larger apparent fields of view, for example, is there an upper limit to what fields of view are possible, other than barrel format? A: Each eyepiece line has been developed out of needs we’ve seen as being unfulfilled. As for what is next? Even if I knew, I wouldn’t tell you anyway! I don’t agree that there is necessarily a push for larger apparent fields. While the human eye is capable of a larger field of vision than any eyepiece currently delivers, weight, size, cost, and performance limitations make it impractical to investigate such designs regardless of barrel size. 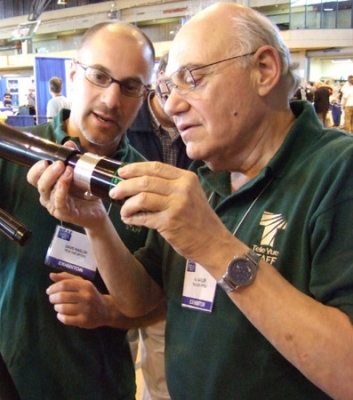 Q: There are a few 3″ eyepieces on the market. Might this be the next frontier for visual amateur astronomy? A: Except for providing long focal-ratio observatory refractors with a bit more true field capability, I see little other need for a long focal length, 3″ format eyepiece. The size, weight, and cost just to gain a bit more true field isn’t worth it with typical amateur refractors, and exit pupil limitations make it a non-starter with Newtonians. It would be more cost effective to buy a shorter focal length telescope! An f/3 Dob with a Paracorr and a 21mm Ethos will have almost twice the true field of view, better off-axis performance, and likely no need for a ladder compared to an equivalent aperture f/6 used with a 41mm Panoptic. Q: Tele Vue obviously has some serious optical and mechanical expertise in house, which means you have the capability to design and build any sort of telescope. So why have you stuck to refractors? A: I’ve always liked the purity of the contrast and pinpoint star images of a quality refractor. The Paracorr goes a long way in making up that ground in a Newtonian system. However, there are so many makers of fine mirrors (I learned how hard it was to make my 8″ mirror in high school, and re-figure a 12″ as well), compound telescopes, tracking mounts, etc., that I have no desire just to compete without bringing anything new to the table. In my refractor designs I have pushed visual and imaging performance in concert with multi-purpose functions and travel-friendly design. We pioneered the multi-purpose telescope with the MPT back in 1980. This 5″, f/4 Petzval type design had a variable iris diaphragm to allow me to tune the color correction for planetary observing while getting all the true field I could from the 508mm focal length. After 37-years, I think I’ve finally reached the ultimate goal with the current NP101is and NP127is. I’m gratified when customers tell me how much they appreciate aspects of what we do, whether it’s our workmanship, service, aesthetic designs, or optical performance. I’m proud to offer the “greenest” products on Earth: They use no power, provide magical experiences, and essentially last forever. Q: We’ve been talking about visual observing, but you’ve been known to do a little imaging, especially with the nifty Tele Vue FoneMate adapter that allows afocal imaging through an eyepiece. As cell phone cameras, and DSLRs for that matter, get better and more sensitive sensors, what’s the future in this relatively accessible form of imaging, perhaps even for accessing brighter DSOs? A: While the mass market technology might be making cameras more capable and less expensive, small pixel size and large sensors put a real premium on both the optical and mechanical designs of the objective. At the high end of this technology spectrum, we’ve addressed this sensitivity along with our friends at Finger Lakes Instrumentation and created the NP127fli. The fast focal ratio and well corrected field of the NP127is objective makes it ideal for cameras like the Microline 694 with its 4.5-micron pixels as well as for the Proline 16803 with its 52mm diagonal chip. At the other end of the imaging spectrum, we have the casual cell phone camera that’s so popular at outreach events for taking snapshots. Of course we know we can take wonderful “afocal” lunar and terrestrial images, but you ask if we’ll ever be able to image deep sky with a cell phone? I can answer this emphatically by rolling a bit of the answer to your next question into this one. We don’t have to wait for the future. It’s already here. 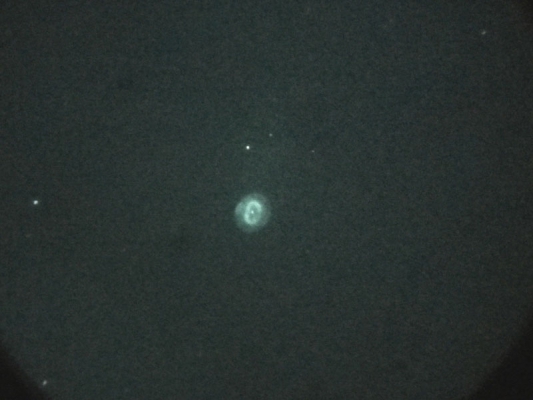 The following image of the planetary nebula NGC 7662 (the Blue Snowball, magnitude 8.6) in Andromeda was taken recently by Dennis diCicco with an 18-inch f/4 Dob using a 7mm DeLite eyepiece (about 270x) and his iPhone mounted to our FoneMate. Okay, so there is still need for processing since this is not a single image but rather a composite of a 20-shot burst from the iPhone. Nevertheless, the point is this is a deep sky image taken with a cell phone camera without any need for tracking! I couldn’t agree more! When I see a technology that can enhance visual and imaging performance to advance the capabilities of telescopes, eyepieces, and observing experiences, and can grow the hobby…count me in! An image of the planetary nebula NGC 7662 taken with an iPhone through an 18″ f/4 Dobsonian reflector, a 7mm DeLite eyepiece, Tele Vue FoneMate™ adapter, and the PVS-14 night vision device. This is an average of a 20-image burst through the iPhone. Credit: Dennis diCicco. Q: You’ve also been collaborating on an eyepiece that combines with night-vision technology to produce an electronically-enhanced view of faint objects for visual observers. Tell us a little about this technology, how it’s different from standard image intensifiers, and when this technology might hit the market. A: Victor DiCosola is an Ethos fan who called Tele Vue for some advice. In chatting with him I learned he owned Tactical Night Vision Company (TNVC). David had been doing some investigation into incorporating an image intensifier into an eyepiece, so I pursued questioning Victor in this, his area of expertise. I realized in that conversation that simply coupling ANY of our long eye-relief eyepieces to the objective of a 1x night vision device could provide “Afocal Imaging” to ANY telescope! David and I agreed this was the simplest, most versatile approach to pursue. 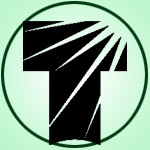 We are now providing adapters exclusively to TNVC (see http://bit.ly/TVONVFULL) that allow easy mounting of certain night vision devices to a variety of our eyepieces from 55mm to 3mm via a Dioptrx type connection. We developed a second adapter that mounts our FoneMate on the night vision device’s eyepiece to permit afocal imaging with cell phone cameras. So, with the addition of a night vision device, you can explore a new visual universe easily with effective “aperture enhancement” for star fields and nebulosity! Both adapters are currently available. My feeling is that even if the investment in a night vision device is significant, the gain in astronomy outreach potential is SO substantial, that every sizable astronomy club and astronomical educational institution should own this! Q: What are some of your favorite objects to look at through a telescope? A: See answer #1. Most Messier objects, the Moon, Jupiter and Saturn of course. To me, aesthetic beauty is paramount, so seeing vast star fields like M24 always excites me. The Double Cluster in Perseus, the Orion Nebula, Omega Centauri globular, and touring the Milky Way are particularly inspiring. Q: This might be a tough one given your long experience, but can you describe one of your most memorable nights of observing? A: I love sharing dark sky viewing with star party friends at places like the RTMC Astronomy Expo, Texas Star Party, Okie-Tex, Winter Star Party, and my favorite place in the world: Stellafane, the birthplace of telescope making in the U.S. I have to mention two times I had “goosebumps” experiences. First, at the Texas Star Party, when I viewed M13 for the first time with the prototype original 13mm Nagler in an 18″ Dob. And second, at Ayers Rock in the Australian outback in 1985 when our club went to see Halley’s comet; I stepped out of the car, looked up at the staggering brilliance of the Milky Way, and THEN looked DOWN to see how it cast my shadow! Q: How have your own interests in stargazing changed over the years? A: I gave up astrophotography many years ago after hand tracking an 80-minute exposure with Plus-X film in my 12″ Newt. Now, I enjoy showing newbies of any age my favorite objects and anything that’s beautiful in my refactors (I love birds too, BTW). I still love peeking in other peoples’ big Dobs with our eyepieces. As mentioned, I’m getting more interested in exploring the sky with night vision devices attached to our eyepieces. It’s like finding a new universe! Q: It seems like the average age of amateur astronomers is getting up there. 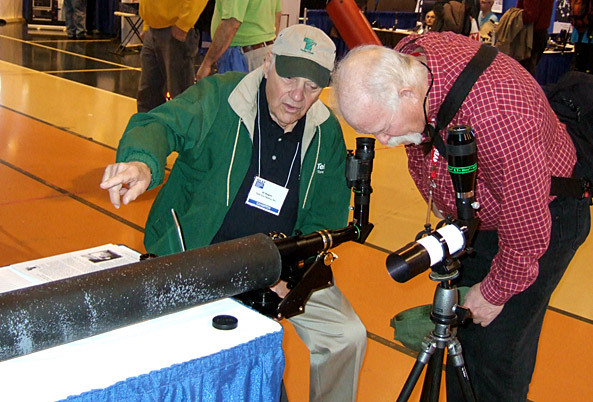 How can we attract more (and younger) people into amateur astronomy, especially in an age with light-polluted skies and short attention spans? A: Outreach, Outreach, Outreach. I love what our Rockland Astronomy Club does with its Summer Star Party in Massachusetts, its Kids Fair, and the incredible NEAF and NEAIC shows, and what the Amateur Astronomer’s Association of New York does in New York City including a star party in Central Park! And let me reiterate what a wonderful tool I’ve found in night vision demonstrations! The genuine excitement generated by real-time night vision viewing, from kids to geezers like me, really brings the wonder of the night sky to those not lucky enough to have dark skies. Hopefully those views help to spur interest in pursuing amateur astronomy, just as a visit to the Hayden Planetarium in NYC with my father did for me. Read more about Tele Vue Optics at this link. This article is © AstronomyConnect 2017. All rights reserved. Images © Al Nagler 2017. Original article on the Astronomy Connect website. Next Next post: Tele Vue Holiday Sale!